1. Integral metal heating, while scope and high precision of temperature control. 2. Timer and timing functions are available. SOX406 Fat Analyzer is base on the Soxhlet extraction principle and integrates such functions as soaking, extraction, leaching, heating, condensation and solvent recovery. 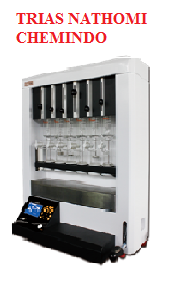 It features sealed metal bath heating with automatic temperature control, ensuring uniform heating and safe operation; six samples can be tested at the same time, and optimal temperature can be selected according to the difference between reagent boiling point and ambient temperature so as to achieve quick analysis; reagents can also be recycled to reduce test cost; and soaking, extraction and solvent recovery can be done in one step. Therefore, this device is characterized by reasonable design, stable performance, good reproducibility, high accuracy, easy operation, saving time and effort, and so on.